Rescuers are widening their search for seven seamen missing after a nuclear submarine sank in the Barents Sea on Saturday, as hope fades of finding any of them alive. Two tugs are scouring waters near the wreck, while helicopters examine the sea and nearby coastal areas. Russia's Northern Fleet said on Monday that there was still a "faint" hope that some of the seamen had survived. However, officials believe their bodies are more likely to be inside the 40-year-old K-159 submarine, which sank in bad weather as it was being towed to a scrapyard. 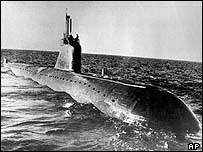 Three of the 10 crew escaped from the submarine and were plucked from the water - but only one of them survived an hour in the freezing waters. Russia's Defence Minister Sergei Ivanov has accused navy officials of negligence, and banned the towing of submarines until further notice. Did the submariners have an escape route? Some reports say bow and stern hatches had been welded shut. The central hatch was open, but it was very narrow, and obstructed by hoses leading from the submarine to the pontoon that was keeping it afloat. Did they hear the warning? The warning was given 40 minutes before the submarine sank. Some reports have questioned whether crew members were able to communicate with one another. Should sailors have been in the submarine at all? Retired officers have been quoted as saying that the submarine should have been towed empty, after being hermetically sealed. An admiral has replied that one man was needed in each compartment to check for leaks. Were there procedural violations? Some reports suggest the weather was too rough and that the submarine was being towed too fast. Others say it lacked lifesaving equipment. Why did the submarine sink? It is known that the K-159 became detached from one of its pontoons. Officers have said it was normal for the hatch to be open, even in bad weather. But some reports talk about portholes being open too. Russian military prosecutors have opened an investigation into the incident. The commander of the region's submarine force has been suspended and a number of navy officials have been charged with violation of navigation rules. The navy's chief of general staff, Admiral Viktor Kravchenko said on Monday that it was essential to raise the submarine in order to remove its reactor. However, experts say this will not be possible until next year. The latest incident comes three years after Russia's worst peacetime naval disaster, when all 118 crew of the nuclear submarine Kursk died when it sank in the Barents Sea on 12 August 2000. Military analyst Alexander Golts said it was one more example of "total decay" in the Russian armed forces. "But it is not just equipment," he said. "There is total decay in terms of morale, discipline and training."